To Cite: Jafari D, Shariatzadeh H, Najd Mazhar F, Jafari S, Tabrizian P. Clinical and Radiological Results of Open Reduction and Internal Fixation for the Treatment of Lately Presented Lateral Humeral Condyle Fractures in Children, Shafa Ortho J. 2018 ; 5(2):e69238. doi: 10.5812/soj.69238. Background: While there is consensus about the treatment of acutely presented displaced lateral condyle fracture (LCF) of distal humerus in children by open reduction and internal fixation, treatment for lately presented LCF remained challenging due to contradictory results of treatments and paucity of studies in this field. Objectives: The aim of this study was to report the clinical and radiological results of open reduction and internal fixation for the treatment of lately presented LCF of distal humerus in children. Methods: Prospectively we studied the clinical and radiographical results of open reduction and internal fixation of 8 patients from 12 cases. These cases had a delayed presentation of more than 3 weeks from injury among those who were referred to our center from 2011 to 2017. We evaluated the range of motion, alterations in carrying angle, presence of prominent deformity, presence of arthritic or neurological symptoms, and finally nonunion or avascular necrosis of the lateral condyle. For assessment of the treatment results we used the Hardacre criteria. Results: A total of 8 patients, including 7 males and 1 female with mean age of 5.2 years (2.5 - 8) bearing time delay from injury to the surgery of 32.4 days (22 - 48), underwent surgical treatment. The mean follow up was 21 months (8 - 54). The main reason for referring to the clinic consisted of palpable mass followed by decreased range of motion. All patients achieved satisfactory union. Of the patients, 2 suffered from complications; 1 patient experienced avascular necrosis of the lateral condyle and the other was complicated by carrying angle abnormality. According to the Hardacre criteria, 6 patients achieved excellent results and 2 patients, with mentioned major complications, obtained fair results. Conclusions: Open reduction and internal fixation of lately presented lateral condyle fracture of distal humerus can result in excellent functional and radiological results in most of the patients. Fractures of the lateral humeral condylar physis, as the 2nd most common type of elbow fracture in children, constitute 16.9% of all distal humerus fractures (1, 2). For acutely presented lateral condyle fracture (LCF) with more than 2 mm displacement, open reduction and internal fixation (ORIF) constitutes the gold standard treatment associated with good or excellent clinical and radiological outcomes (3-5). For LCF with lesser than 2 mm displacement, closed reduction and percutaneous fixation or immobilization are recommended as effective treatment options (3). However, for patients who are presented with delayed diagnosis or lost primary reduction of LCF, decision making is not easy due to controversial reports (6, 7). Although previous studies did not report satisfactory outcomes following ORIF for lately presented LCF, surgical interventions for these kinds of injuries are more recommended recently (6, 7). The aim of this study was to report the clinical and radiological results of ORIF for the treatment of lately presented LCF of distal humerus in children. This prospective study was approved by the ethics committee of our center. Furthermore, written consent was received from the parents to report and publish the results. Prior to any intervention, we discussed the matter with the parents regarding the existing evidences from other researchers. We explained the risks and benefits including the potential complications secondary to surgical intervention or leaving the fracture alone. In fact, we used plain anteroposterior (AP) and true lateral (Lat) radiographs to measure the displacement of LC or assess the fracture union. Therefore, we did not order a CT scan to evaluate the pattern or the union of the fracture. Our inclusion criteria consisted of more than 21 days elapsed from untreated injury, displacement more than 2 millimeters, and having at least 6 months follow up period prior to report the results. We excluded the patients who received any surgical treatment before their admission including closed reduction and percutaneous fixation as well as those who expressed a history of previous trauma to the same elbow. We also excluded the patients who had a follow up duration of less than 6 months at the last visit prior to reporting the results. All surgeries were performed by one fellowship trained hand surgeon (F.N.M). Surgeries were done under general anesthesia after applying pneumatic tourniquet and prophylactic antibiotic (Cefazolin 30 mg/kg IV). We used a lateral approach between triceps in the posterior and brachioradialis in the anterior. By shaving the anterior capsule from the anterior surface of distal humerus we were able to assess the situation. We did not find any bony union in the fracture sites and all displaced lateral condyles were mobile. The crucial step of the treatment was the reduction process. In order to prevent avascular necrosis of the lateral condyle, we did our best to be gentle and avoid any soft tissue damage to the posterior part of the displaced lateral condyle, assuming that the major blood supply of this part is originating from the posteriorly entered vessels. We used small towel clips and “joystick” Kirschner wire (KW) to move and reduce the condyle fragment after refreshing the fracture site and removing any fibrotic tissue by a small curette. Our main goal was to reduce the articular surface regardless the irregularity of the metaphysis. Anatomic reduction of the articular surface was achieved in all patients. Fixation was obtained by application of 2 or 3 1.5 mm KW with preferably divergent orientation. The quality of the reduction was assessed both clinically and using potable radiography. Finally, a bulky dressing was applied and immobilization was provided by a long arm splint held in 90 degrees flexion. Sutures were removed after 2 weeks while both splint and KWs were removed at the 6th week. Subsequently, all patients were allowed and instructed to initiate active exercise. We did not refer any patient to the physical therapy department. The assessment of the clinical and radiographic finding was done by a hand surgery fellow who was not involved in the treatment process. We evaluated the range of motion, neurologic assessment, and radiographic evaluation including preoperative and postoperative range of motion of the injured elbow, neurologic examination, radiographic findings like AVN, LC hypertrophy, fish tail deformity, arthritic change, and alteration in carrying angle (CA) by using AP and true Lat plain radiographs. At the last visit, we asked the radiographs of both elbows in order to compare the bony features. For final assessment we used the Hardacre criteria Table 1 (8) and Figures 1 - 3. Table 1. Evaluation of Results by Hardacre et al. The patients included 7 male and 1 female. Right side elbow was involved in 5 patients while in the remaining 3 patients the left elbow was injured. The mean age was 5.2 years (2.5 - 8). Time delay average from injury to the surgery was 32.4 days (22 - 48). The mean follow up duration was 21 months (8 - 54). The main reason for referring to the clinic was palpable mass followed by decreased range of motion. None of our patients had ulnar nerve palsy preoperatively. The operating surgeon did not find any bony union between the lateral condyle fragment and distal humerus in any of the patients during the intraoperative assessment. A total of 2 patients suffered from complications discovered at the follow up visits; 1patient became involved with AVN and the other one complicated by carrying angle abnormality. According to the Hardacre criteria 6 patients achieved excellent result and 2 patients with mentioned major complications obtained fair results (Table 2). Abbreviations: AVN, avascular necrosis; CA, carrying angle; DROM, decreased range of motion; EX, excellent; F, female; M, male; P, Pain; PM, Palpable mass; ROM, range of motion. Even though timely proper treatment of displaced LCF by means of open reduction and internal fixation mostly end to a good or excellent functional and radiographic result, neglected or lost reduction of displaced LCF of humerus in children can lead to nonunion, cubitus valgus, decreased range of motion and lately presented sign and symptoms of compromised ulnar nerve (2, 9). Most reports on the management of lately presented or neglected LCF of distal humerus in children came from developing countries (9). Poor quality radiographs, treatment by bonesetters, and lost reduction after conservative treatment could be some of the reasons for delayed seeking of treatment by the parents in those countries (10). While there is consensus about the treatment of acutely presented LCF of distal humerus in children by different kind of methods including conservative treatment, closed reduction, and percutaneous fixation or open reduction. According to the stage of the fracture and its displacement, this is not true about the lately presented or neglected LCF (9, 11). In lately presented cases, surgical treatment and open reduction can be difficult and problematic due to the soft tissue contracture, fibrosis formation, difficult anatomic reduction, and putting in jeopardy already tenuous blood supply of the displaced LC fragment, which can be a result in its AVN (11). Earlier reports of treatment for lately presented LCF were inconclusive. In 1975, Jakob et al. reported the outcomes of surgical treatment for 7 patients after 3 weeks of delay in presentation including, loss of ROM, malunion, and nonunion. Consequently, he concluded that there was no significant difference between the results of surgical and conservative treatment for lately presented LCF of humerus in children (11). In 2012, Aggarwal et al. reported the result of open reduction and internal fixation of 22 neglected LCF (9). 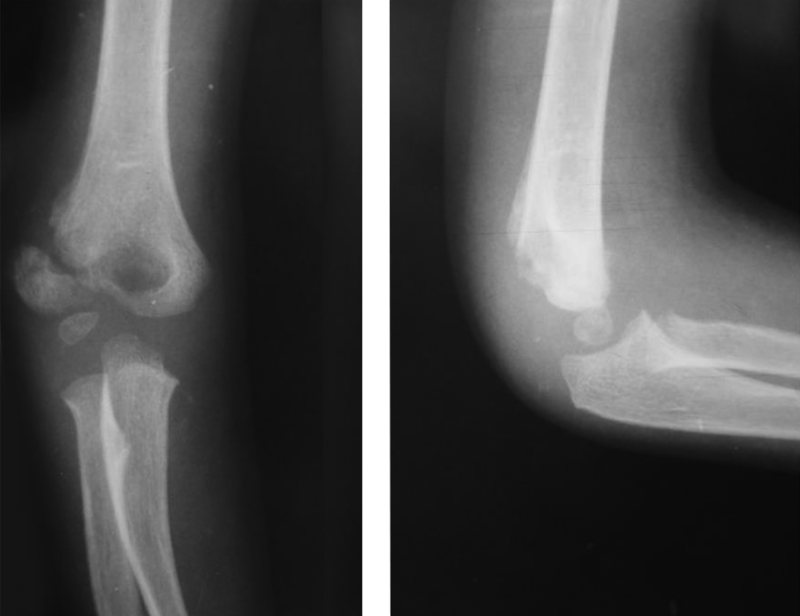 While they reported complications such as 1 case of malunion, AVN in other case, prominent lateral condyles in 4, fish tail appearance in 7, and premature epiphyseal closure in 2 cases, the overall results indicated a high rate of union and satisfactory elbow function after open reduction and osteosynthesis in patients with late presenting LCF in children (9). Dhillon et al., reported their results after surgical treatment on 16 patients who presented and underwent surgery after 3 weeks of injury; good elbow function in 5, fair in 7, and poor in 4 patients, according to their own proposed criteria (6). Based on their results they did not recommend surgery in patients presenting more than 6 weeks after injury (6). According to Ali et al. surgical treatment and ORIF of late presenting LCF of distal humerus between 3 to 12 weeks after injury is an effective treatment and can result in acceptable results (12). They reported the outcomes after surgical treatment of 18 lately presented LCF with 15 months follow up. They had excellent results in 5 patients, good in 3, fair in 6, and poor in 4 patients, according to the Aggarwal criteria. They also emphasized gentle manipulation in open reduction by avoiding jeopardizing the tenuous blood supply of the displaced LC fragment, which can be result in its AVN (12). We treated 8 lately presented LCF patients with the mean age of 5.2 years and mean follow up of 21 months. With delicate and gentle manipulation, followed by anatomic open reduction and internal fixation, we achieved excellent result in 6 of them, which was in accordance with the previous studies results. Malunion, nonunion, altered carrying angel, fishtail deformity, AVN of the lateral condyle, premature physeal closure, and pin site infection are among the mostly reported complications. However, we did not find any pin site infection, fishtail deformity, or nonunion in our patients. Only 2 patients suffered from major complications, 1condylar AVN and 1 abnormal carrying angle. Our fair results were also corresponding with the previous studies (9, 10, 12). Our study has some shortcoming including small sample size, which limited our ability to compare the results between groups with different time delay in addition to midterm follow up period. Studies with large sample size or randomized controlled trials for comparing the result of surgical and conservative treatment could be a result in more conclusive outcomes. In conclusion, according to our results obtained from surgical treatment of lately presented LCF of distal humerus in children, we can highly recommend surgical intervention for these challenging injuries with expectation of excellent functional and radiological results in most circumstances. 1. Landin LA, Danielsson LG. Elbow fractures in children. An epidemiological analysis of 589 cases. Acta Orthop Scand. 1986;57(4):309-12. [PubMed: 3788491]. 2. Flynn JM, Skaggs DL, Waters PM. Rockwood and Wilkins' fractures in children. Lippincott Williams & Wilkins; 2014. 3. Flynn JC. Nonunion of slightly displaced fractures of the lateral humeral condyle in children: an update. J Pediatr Orthop. 1989;9(6):691-6. [PubMed: 2600178]. 4. Liu TJ, Wang EB, Dai Q, Zhang LJ, Li QW, Zhao Q. Open reduction and internal fixation for the treatment of fractures of the lateral humeral condyle with an early delayed presentation in children: a radiological and clinical prospective study. Bone Joint J. 2016;98-B(2):244-8. doi: 10.1302/0301-620X.98B2.34429. [PubMed: 26850431]. 5. Jafari D, Joudi S, Hassany Shariat Panahy P. Clinical and Radiographic Evaluation of the Operative Treatment of Lateral Humeral Condylar Fracture in Children at Shafa Hospital, Tehran, Iran. Shafa Orthoped J. 2016;In Press(In Press). doi: 10.17795/soj-6773. 6. Dhillon KS, Sengupta S, Singh BJ. Delayed management of fracture of the lateral humeral condyle in children. Acta Orthop Scand. 1988;59(4):419-24. [PubMed: 3421080]. 7. Bauer AS, Bae DS, Brustowicz KA, Waters PM. Intra-articular corrective osteotomy of humeral lateral condyle malunions in children: early clinical and radiographic results. J Pediatr Orthop. 2013;33(1):20-5. doi: 10.1097/BPO.0b013e318279c4cd. [PubMed: 23232374]. 8. Hardacre JA, Nahigian SH, Froimson AI, Brown JE. Fractures of the lateral condyle of the humerus in children. J Bone Joint Surg Am. 1971;53(6):1083-95. [PubMed: 5092798]. 9. Agarwal A, Qureshi NA, Gupta N, Verma I, Pandey DK. Management of neglected lateral condyle fractures of humerus in children: A retrospective study. Indian J Orthop. 2012;46(6):698-704. doi: 10.4103/0019-5413.104221. [PubMed: 23325975]. 10. Saraf SK, Khare GN. Late presentation of fractures of the lateral condyle of the humerus in children. Indian J Orthop. 2011;45(1):39-44. doi: 10.4103/0019-5413.67119. [PubMed: 21221222]. 11. Jakob R, Fowles JV, Rang M, Kassab MT. Observations concerning fractures of the lateral humeral condyle in children. J Bone Joint Surg Br. 1975;57(4):430-6. [PubMed: 1104630]. 12. Ali Z, Tahir A, Ali N. Treatment of Old Fractures of Lateral Condyle of Humerus in Children. Pak Pediatr J. 2012;36:152-7.